A member of the Commonwealth of Independent States (CIS), the Republic of Azerbaijan ( Azarbaycan Respublikasi ) gained its political independence, in 1991, in the wake of the former USSR collapse. It is a country of Turkic Muslims that remains in territorial conflict with adjacent Armenia, over the Azerbaijani Nagorno-Karabakh. This conflict has had an enormous human and economic cost of over 750,000 refugees and internally displaced persons (IDPs), representing slightly less than 10 percent the total population of 7.8 million Azerbai-janis. Azerbaijan's average life span is short, with less than seven percent of the population above the age of 65. The mortality rate is nearly twice the birth rate (9.5 births per 1,000, and 18.5 deaths). Most of the population speaks Azeri, but minorities also speak Russian and Armenian. Ethnically almost all of the population is Azeri, and 93 percent are Muslims, although few practice. Literacy is high at about 97 percent. Geographically situated within southwest Asia, Azerbaijan is a land of 33,400 square miles. It borders the Russia and Georgia to its north; Iran to the south; Armenia to the west; and the Caspian Sea to the east. Its capital city is Baku with a population of about 2 million people, or about 25 percent the total population. Historically, Azerbaijan was the home of the Scythian tribes, incorporated into the Roman Empire. Overrun by the Ottoman Empire in the eleventh century, it was occupied by the Russians in 1906 and 1913. In December 1922, it was officially annexed by the USSR. In 1936, it metamorphosed into a constituent part of the Soviet Union. On December 26, 1991 it spun out from the Soviet orbit and became politically independent. Fights between Muslim Azerbaijan and neighboring Christian Armenia escalated between 1992 and 1994 over the enclave of Nagorno-Karabakh, over which both proclaim sovereignty. and a national constitution has ensued since 1995. The infant media reflects the nascent political entity. Newspaper circulation remains weak at 28/1,000 people (compared to 267/1,000 in Russia and 228/1,000 in the USA). In 1998, a presidential decree abolished censorship, but media and press restrictions continue. The international statistical news and descriptive media, as well as the local sources, present Azerbaijan as empirically a uniquely oil-rich country. For, despite a decline in oil production, over the late nineties, a trend reversal has emerged, in particular at the aftermath of the Production-Sharing Arrangements (PSAs) negotiations and deals with a multitude of foreign transnational corporations (FTCs). These FTCs have committed over $60 billion to oil field exploration, development, implementation, trade, and worldwide consumption. Naturally, these major international currency funds ought to trigger industrial and economic activities, pre-and post-oil realizations. The majority of the population, 60 percent, still lives under the poverty level. 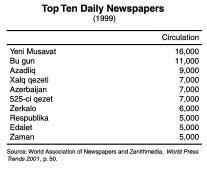 The Azerbaijani media is instrumental in reporting such major economic problems. The national budget stands at about $800 million whereas public spending is at a relatively higher point of approximately one billion dollars. It is incumbent upon the Azerbaijani press and media, including the nascent Internet technology and e-journalism, to spread the word about the considerable Azerbaijani economic opportunities and challenges. In addition to the Articles 47 (Freedom of Thought and Speech) and 49 (Freedom of Information), many ordinances and decrees (particularly, the sweeping anti-censorship decree of 1998) promote free and open information. Hayat , Khalg GazetiBakinskii Rabochii , the weekly English newspaper, ANS, Azertag, BBC Azerbaijan, the Media Press Agency, Internews Azerbaijan, Azerbaijan Broadcasting Agency, Azerbaijan State TV, and foreign media are all entitled to open and free news. Journalists and media companies, however, must pass the screening tests of the Information Ministry, Ministry of Culture, and other governmental authorities. This includes paying fees and posting bonds, supporting the government against terrorism and the Armenian occupation of the Karabakh enclave, avoiding obscenity and rebellious incitements against the government, protecting the constitutional rights of the Azerbaijani people, reporting fraud and crimes, and supporting the constitutional institutions. The current Azerbaijani Constitution and a number of press laws fully support the use of mass media (print, audiovisual, videoconferencing, satellite communications, cyberspace, etc.) to spread the word on the democratic, frontier capitalism experiment in Azerbaijan. The Constitution encourages Azerbaijanis living overseas to be in touch with the home media, foreign-linked media, and even to form their own press (e.g., the Azerbaijan International Magazine ) to spread news and information about the local politics, elections, and socio-economic development national issues. Articles 15 and 16 of the Constitution express that Azerbaijan's vision is to establish a political liberal democracy in conjunction with a free market economy. The mass media are asked to play a crucial role in informing, disseminating, and reporting about these ideals, the constitutional foundations, and the means of their achievement. Even diplomatically, this new transitional capitalist power aims, via the media diffusion within and without Azerbaijan, to foster relations with the industrialized capitalist West, principally Western Europe and the USA. The press and media prides itself in informing about the cooperative efforts with the USA in fighting and jointly combating "…terrorism, [instituting] the modernization of frontier troops, and [the] coordination of efforts on non-proliferation of mass destruction weapons, trade and preparation to admit Azerbaijan to the WTO, and humanitarian sphere." (local media, azertag.com , president.com , etc.). The media was eager to report that The Bush Administration, within the 2002 fiscal year framework and the subsequent "Freedom Support Act", allocated $50 million to Azerbaijan. Pentagon military assistance, privatization enhancement, agricultural assistance, and education cooperation are other media-publicized U.S. elements of economic help. Correspondent: How will you comment [on] (the) yesterday's statement of the Chairman of the Council of Europe Parliamentary Assembly on journalists? Ilham Aliyev: Today in Azerbaijan every condition for independent mass media is established. When I asked you how many newspapers are published in Armenia, you said about 6-7. But we have over 100 [including regional and small] daily newspapers, which mainly represent numerous circles of political establishment. Censorship has been abolished in Azerbaijan, freedom of speech is guaranteed and not under control. There are, of course, cases when the officials are subject to different critics. In some cases, even the journalists are brought to court, because they use unverified facts, often slanderous, then the court passes a decision against the newspaper. This is a democratic mechanism and there is no another. Therefore, to say that there are problems in the mass media of Azerbaijan, I think, is not right. Effectively, since the newly introduced Constitution, the Azerbaijani mass media have proliferated and acquired a myriad of investigative, reporting, and broadcast rights. The Parliament, the Ministry of Justice, the Ministry of Information, private journalist organizations, and the foreign media provide a variety of safeguard devices against censorship, reporting official bureaucratic abuses, bribery and corruption, violation of the constitutional civil rights of the Azeri people, and the freedom and independence of journalists. Gradually, however, particularly in virtue of more training, journalistic education, openness, and objective but courteous reporting, censorship should eventually be eliminated. The Constitution purports an open and uncoerced media and press system in Azerbaijan. Thanks to international satellite communications, such a media policy is, to some extent, observed. The Parliament News and the Press Service of the Ministry of Justice, albeit the many faces of governmental control, use the media to promote freedom of expression, human rights, the freedom of assembly and peaceful strikes, ecological integrity, academic freedom, diversity and tolerance, etc. During a visit by the Council of Europe (COE), the Head of the Justice Ministry stated that Azerbaijan was a member of a number of international conventions against racism, religious intolerance, genocide, apartheid, and censorship (Azerbaijan media, March 28, 2002). As stated above, the 1995 Constitution guarantees many press and media rights and responsibilities. Precisely, Article 28 stresses the Right to Freedom, Article 40 emphasizes the Right to Culture (the arts, literature, humanities, communication and media, lingual and religious diversity, etc. ), Article 47 focuses upon the Freedom of Speech, and Article 49 zeroes in on the Freedom of Information. There is a need for the State of Azerbaijan and related institutions, principally the Ministries of Culture, Information, Justice, Education, and Foreign Relations to facilitate the role, tasks, functions, dynamics, and objectives of the Azerbaijani media and foreign-linked media. The media are expected to keep tabs on the government as well. However, further reform is required with respect to circumventing corrupt reporting; promoting the media coverage of the whole nation; fairly representing the national identity and culture; and emancipating the media and press from the yet visible tight hold of the State. The press and media are justifiably a necessary tool to building democracy and contributing to the artistic, scientific, technologic, political, and socioeconomic development of any country, and specifically to Azerbaijan's internal and global prosperity, the inter-cultural and inter-civilizational harmony amongst nations, and planetary peace. There is a strong correlation between the type of governmental structure, dynamics, and ends-in-view and the press and media system within a specific country. Generally, the more democratic and participatory a nation, the more liberal and uncoerced the press and media, and vice versa. Although the Democratic Republic of Azerbaijan came into being, historically, on May 28, 1918, it did not regain its autonomy until August 30, 1991 from the Soviet Union. The press and media, throughout seventy-three years of Soviet political and economic satellitism, were the replicas of the central Moscow government. Pravda and Moscow News , formulated, delivered, and manipulated most of the information system in Baku and beyond. On November 12, 1995, the country adopted a democratic constitution that went into effect two weeks later. Its main six intentions are territorial integrity, democracy, civil society, a secular state, a free market-centered economic system that shall foster higher standards of living for every Azerbaijani, and a faithful ideology in human universal values and international law. Precisely, its basic tenets are: i) universal suffrage at 18 years of age; ii) a national civil law system; iii) the change of name from Azerbaijan Soviet Socialist Republic to the Republic of Azerbaijan (Azarbaycan Respublikasi); iv) the inception and the administrative autonomous re-organization of the country into 59 rayons, 11 cities, and 1 autonomous republic; v) an open press and media system throughout the nation; vi) regular presidential elections via popular vote every five years; vii) regular elections of a Unicameral National Assembly ( Milli Mejlis ) of 125 members, for a five-year mandate, via popular vote; viii) multipartism, hence multi-media/multi-press systems; ix) promotion and advent of political pressure groups and leaders; x) presence and maintenance of open and mutually fruitful relations with all sovereign nations via membership into a variety of world entities; and xi) the fostering of a free democratic, market-like, and capitalist transitional society, based on free competition, cooperation with the CIS, religious tolerance, state secularism, and the promotion of macro-growth and economic development in Azerbaijan as well as the participation in the causes of peace and prosperity worldwide. Many challenges and threats remain, principally because of the Azerbaijani-Armenian conflict, the surrounding conflicts (the Gulf and Mideast problems, and the Pakistani-Indian crisis) and the anti-terrorism war in Afghanistan. Azerbaijan has formed a variety of agreements with foreign media that are for the most part open and intended to be constructive. 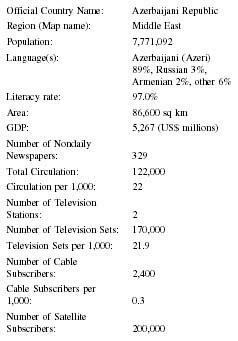 Azerbaijanis are eager to read, watch, and listen to the foreign media, particularly Western European and American. To those with the financial means, access is available to international broadcast via satellite, as well as publications such as the New York Times , Le Monde, and the Wall Street Journal . Foreign journalists can easily access Azerbaijan by acquiring a visa through the Azerbaijan embassy in their home country. If national media is suppressed in content or delivery, people will increasingly look at the foreign media and private radios, television channels, and press systems. The danger may be the loss of some of the national identity and culture. natural gas resource-endowed Azerbaijan.Azer.com , for example, is one of the most comprehensive search engines on this country. There can be some difficulty on Azerbaijani sites due to orthographic differences between transcriptions of Azeri and Russian. An early law, passed by the Azerbaijani Parliament on December 25, 1991, envisioned such problems and therefore adopted an altered, Latinized alphabet to substitute for the Cyrillic. Some of the frequently broadcast topics and themes include, but not limited to, the Azerbaijani culture, the arts, the territorial conflict with Armenia, the IDPs and refugees, the oil and gas economies, frontier capitalism, public policy in Azerbaijan, state secularism, technology in Azerbaijan, international and diplomatic relations, education, the media and press themselves, crimes, unemployment, corruption and bureaucratic inefficacy, censorship, tourism, business, the role of the Azerbaijani women, elections and politics, and the Constitution. 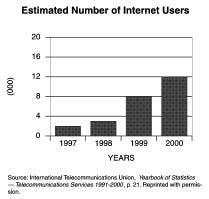 One advantage of the Internet is that it has been able to make the Constitution more accessible. Articles 47 and 49, which specifically address the freedom of speech and the freedom of information, have been particularly of interest to the media. Internet publishing has been strongly influenced by Western business media. Higher Learning Institutes in Azerbaijan are rapidly growing and diversifying. The largest concentration of these educational and formative institutions is in the capital Baku, with 17 major schools. The Azerbaijan State Pedagogical University, Baku State University, and Khazar University are some of the main higher learning centers for training in the field of mass media and press. At Khazar University (KU), a Bachelor of Arts in Journalism is offered. It aims at acquiring strong journalistic, press and media, professional and practical skills, along with a social science and training background in ESL and ESP. Specifically, this major offers a broad education and training in the print and broadcast news professions, predicated upon the ongoing needs and changes in the Azerbaijani and world societies. It also encourages the student, or potential journalist, in learning and acquiring on-hand experience via the KU Press activities, the Khazar View Magazine, and the KU Radio and TV studios. A miscellany of awards is conferred, from the academic training and graduation to the professional, governmental, and international echelons. The Business Journalists Association in Baku is an entity that fosters competition amid economic and business journalists, allocates monetary prizes, and facilitates trips and journeys. Within many of the major daily newspapers, and State and foreign mass media groups, bonuses and awards are afforded. In fact, the media profession is an attractive career, although compensation and wages are still comparatively low. Since gaining its independence from the USSR in 1991, Azerbaijan has worked to foster a system of free press. Under the new constitution, the rights to free speech and free press are protected, but there is still censorship both by the government and by journalists. Conflict with Armenia and the struggle to build a democratic country have slowed efforts to improve the press system. Many universities offer journalism programs, and the media is becoming a more and more popular career choice for many people, even though it is still developing. Azerbaijan International . Available from www.azer.com/ . Economist . Available from www.economist.com/ . Ellits, M. First English Long Travel Guide to Azerbaijan with Georgia . Yorkshire: Trailblazer Publishing, 1999. Embassy of the Republic of Azerbaijan . Available from www.azembassy.com/ . Goltz, T. Azerbaijan Diary . White Plains, NY: M.E. Sharp, 1998.
International Monetary Fund. Finance & Development . 2002. Said, K. and J. Gramen. Ali & Nino . New York: Overlook Press, 1998. Sarri, S. Ethics of the International Monetary Systems . Philadelphia: University of Pennsylvania Press, 1998. ———-. Prolegomena to Islamology . LeGlobe, 1988. ———-. Poetic Reflections . Rosethorn Press, 1991. ———-. Visions . EMW Publishing, 2000. ———-. Middle Easterners & North Africans in Las Vegas (MENAs)-A Socio-Economic and Geo-Political Survey . EMW Publishing, 2002. ———-. Applied Financial Economics . La Jolla, CA: Copley Press, 2001. ———-. Twenty-first Century Macroeconomics . Redding, CA: CAT Publishing, 2000. ———. Twenty-first Century Microeconomics . Redding, CA: CAT Publishing, 2000. Swietochoswki T. and Collins, B. Historical Dictionary of Azerbaijan . Lanham, MD: Scarecrow Press, 1999. U.S. News . Available from www.usnews.com/ . The Wall Street Journal . Available from www.wsj.com/ . The Washington Post . Available from www.washingtonpost.com/ .